The French bulldog is a highly popular breed, definitely in part because it’s so darn cute! To help you provide your Frenchie with top-notch nutrition, we’ve researched and reviewed dog food for bulldogs and small breeds to help you pick the best one for your pooch. Before getting into the reviews, check out the following information to consider when choosing a dog food! Food Type - Wet, dry, and raw are the main types of raw dog foods. We focus mostly on dry food this time around! Dog Age - Different dog foods are formulated for different doggy life stages, from puppy to adult to senior. 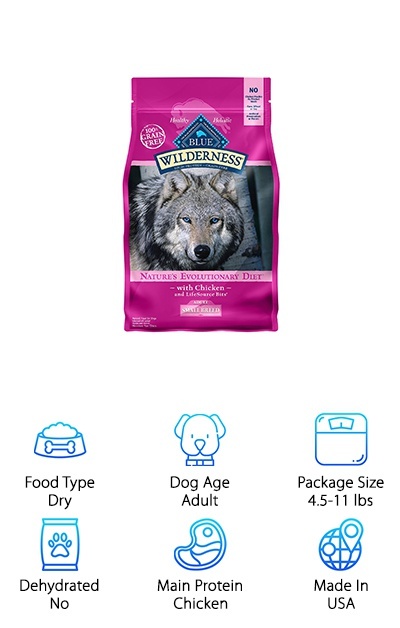 Package Size - How much kibble are you getting? Compare value between different products with the package size! Dehydrated - Dehydrated food has become a popular raw food option for people looking for longer shelf lives. Main Protein - Choose an interesting protein source or stick with the basics depending on your dog’s needs. Made In - We preferred to look at dog foods made in factories in the USA, which helps ensure great quality control. Make sure to have your Frenchie sitting beside you to give you their opinion as you read. Ready? Great! Our top pick and budget pick summarize our overall favorites, but there are a ton of other great options out there that we included after that. Let’s dig in! 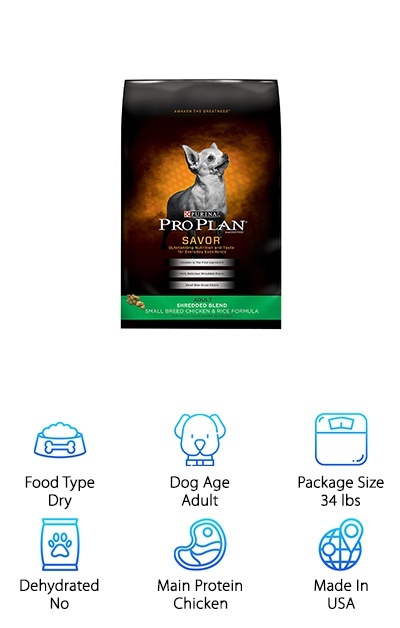 The Purina Pro Plan Savor Shredded Blend for small breeds features a mix of textures and a delicious taste that’s perfect for fussy or picky dogs who can be reluctant to eat. With such a low price, no wonder it made our list for the best food for bulldogs! Besides the great value, it has all of the vitamins and nutrients your dog needs, plus tons of protein for complete nutrition. The small kibble pieces are mixed with tender shreds that encourage your dog to chew and even clean out their bowl! Prebiotic fiber sourced from wheat bran helps ensure their digestive system stays in great shape. Keeping their skin and coat in good condition just go easier with the supplements of vitamin A, linoleic acid, and omega-6 fatty acid. If you want to give your French bulldog some tasty chow that’s easy to chew and nutritious to boot, it’s hard to say no to Purina Pro Plan Savor Shredded Blend! 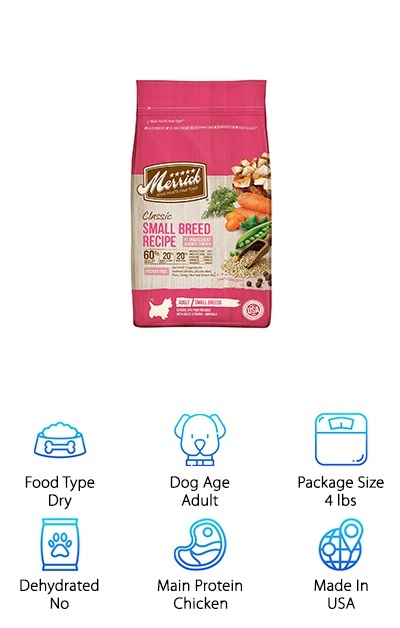 Merrick Classic Small Breed dry dog food is a great option for the best dog food for bulldogs. First off, the 30% protein content is ideal for the muscular bodies of French bulldogs. And the sources of that protein are amazing: deboned chicken, chicken meal, and turkey meal. Peas, brown rice, and quinoa provide healthy sources of complex carbohydrates--no corn, wheat, soy, or potatoes! This small breed recipe is made for the needs of dogs up to 30 pounds and has small kibble pieces. Omega-3 and omega-6 fatty acids help keep their coat shiny and their skin smooth, while leading levels of glucosamine and chondroitin provide joint support. Plus, several probiotics help to keep their digestive system going strong! 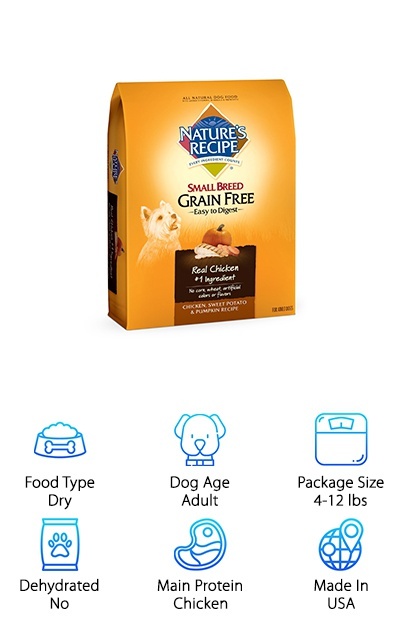 It’s a great choice for dogs with food allergies and intolerances, or for owners who just want to keep their dog’s meals grain-free with no animal by-products! 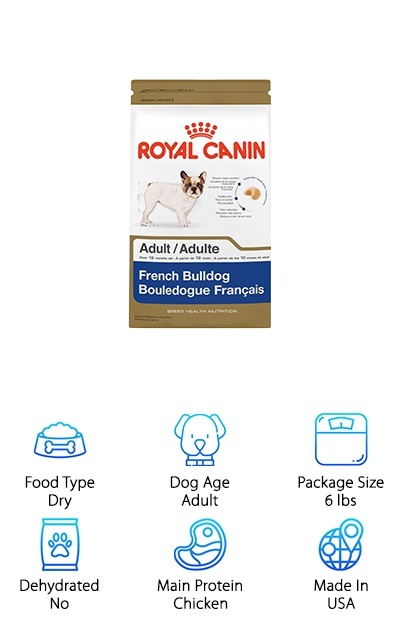 If you want a dog food designed just for your Frenchie’s needs, the Royal Canin Breed Health French Bulldog dry dog food just moved to the top of your list. The kibble pieces were designed with the French bulldog’s short but powerful jaws in mind. Shaped like cashew nuts, the small pieces are easy to grasp and chew, and help maintain their dental health. Supplements of EPA and DHA provide support for good skin and coat health. The 24% minimum protein content and L-carnitine supplement helps support your Frenchie’s muscular stature. Royal Canin also took the French bulldog’s “gassiness” into consideration, and many people have noticed their French bulldog is less gassy with this diet! The right balance of fiber from dried beet pulp and prebiotic FOS help decrease stool odor--a great feature in a dog food! The cherry on top: a full range of vitamins and nutrients ensure total nutrition and health inside and out. If you’re looking for the best dog food for French bulldogs with all-natural ingredients, your search ends here! Blue Wilderness High-Protein, Grain-Free Small Breed Formula dog food provides 36% minimum crude protein compared to the average 20-27%, so it’s ideal for highly active dogs. This protein comes from deboned chicken, chicken meal, and fish meal--no animal by-products or mystery meat! Rather than corn, wheat, or soy, carbohydrates come from sweet potatoes, peas, and potatoes, which are easy to digest. If your active French bulldog has an allergy to grains like corn, wheat, or soy, switching them to a nutritious grain-free dog food can help ease their symptoms. Antioxidants, vitamins, and minerals are supplemented in LifeSource Bits, which are made separately from the kibble at a lower temperature to keep the nutrients intact. Blue Buffalo is an amazing source for high-quality dog food that provides total nutrition and tons of protein! 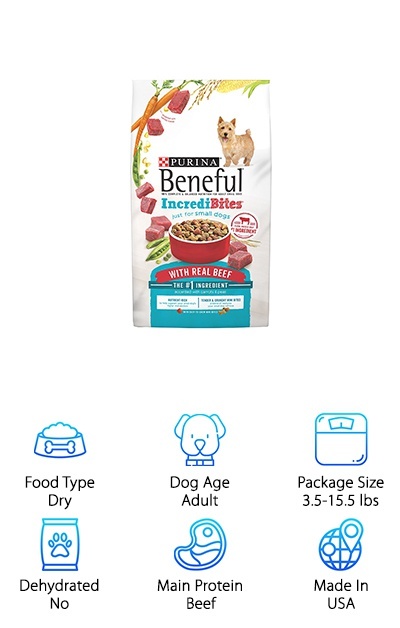 Giving your dog top-of-the-line nutrition is easier than ever with Purina Beneful Incredibites for small dogs. The small kibble pieces come in a mix of shapes with tender and crunchy textures to help keep your dog interested in what’s in their bowl! With the main protein sources of beef and chicken by-product meal, your dog gets a ton of protein plus a ton of flavor. Vitamin and mineral supplements ensure they have the nutritional support they need for a healthy immune system, a shiny coat, strong bones, and more. The bag has a resealable zipper to keep the stored kibble fresh and conveniently sealed away between meals. This dog food is a great option for picky dogs thanks to the interesting textures and flavors while still giving them complete nutrition. Plus, Purina is known for providing dog foods with a high value and low price that won’t make your wallet cry! Sometimes a dog can become allergic to common dog food ingredients, including proteins like chicken or beef. Putting your dog on a grain-free, poultry-free diet can seem impossible, but Wellness dry dog food has come to the rescue! 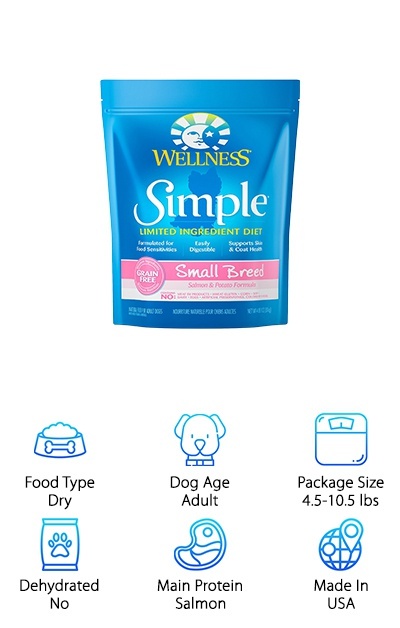 The Wellness Simple Limited Ingredient Diet in the Small Breed Sweet Potato & Salmon recipe is ideal for small dogs with allergies and sensitivities. With no gluten, wheat, corn, meat by-products, dairy, or eggs, it cuts out a lot of potential allergens that can affect a dog with sensitive skin or a sensitive stomach. The small kibble size is perfect for your Frenchie’s small mouth and short muzzle. Made with salmon, salmon meal, peas, and potatoes as the main ingredients, prebiotics and probiotics support digestive health while supplements of vitamins and minerals provide additional benefits. If your French bulldog has a sensitive stomach, this natural, limited ingredient dog food is a good choice! Made in the USA with all-natural ingredients, Nature’s Recipe Small Breed dry dog food is a great choice for a grain-free dog food for your French bulldog. If your dog has an allergy or sensitivity to corn, wheat, or soy, this dog food uses garbanzo beans, peas, sweet potatoes, and pumpkin as carbohydrate sources that are easy to digest. Chicken and chicken meal provide high-quality protein sources to keep your dog’s muscles strong and lean, plus added vitamins and nutrients support your dog’s health from nose to tail! Omega-6 and omega-3 fatty acids support healthy skin and coat, while calcium, vitamin D3, and phosphorus support their bones and teeth. No fillers and no animal by-products, either! This is a high-quality dry dog food and one of the best bulldog food options on the market thanks to the tasty natural ingredients and small kibble size that’s easy to chew. 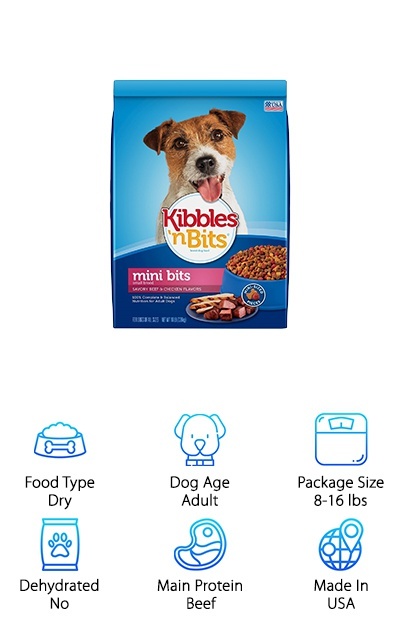 Kibbles ‘n Bits is another source for value dog food with a great price. Their Small Breed Mini Bits line comes in a savory beef and chicken flavor in small kibble pieces with a variety of shapes and colors. It helps keep your dog interested in their food and it’s easy to chew, too! Small breed dogs seem especially prone to appetite issues, so tempting them with a flavorful kibble is the first step towards getting them to eat consistently. Since French bulldogs have shorter snouts, they need a small kibble that’s easy to grasp and chew. Some people have also used these little bits as training treats rather than a meal! Keep in mind that if your Frenchie has digestive issues or an intolerance to corn, wheat, or soy, this dog food has all of those ingredients. Overall, many dog owners have had success with this kibble for their small dogs! 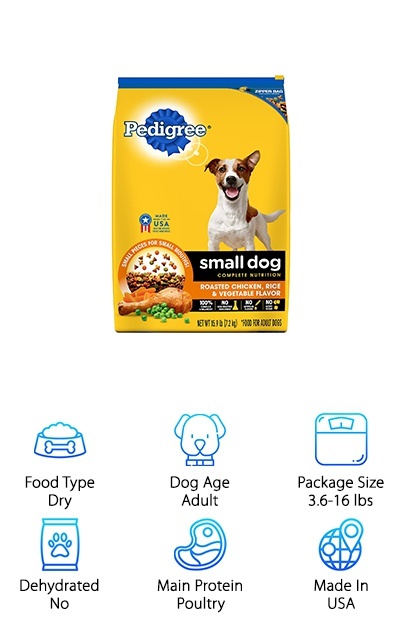 Pedigree Small Breed dry dog food comes in chicken, salmon, or steak flavors and small kibble pieces in a variety of fun shapes and textures. If you’re looking for a nutritious dog food available at a low price with great value, Pedigree is a top choice! The ingredients provide sources for chondroitin and glucosamine for joint health, plus calcium for strong bones and teeth. Omega-6 fatty acids help keep their skin healthy and hydrated and support a soft coat. The kibble is designed to help out with your dog’s oral care, too, which is helpful for small breeds prone to dental issues. Many dogs find it tasty, and many owners appreciate the low price! Keep your dog eating well and feeling great with a delicious and nutritious dry dog food kibble. You can also switch between flavors if your dog gets bored with the same-old, same-old! Unfortunately, sometimes our canine best friends can be prone to itchiness, flaky, skin, and red patches due to allergies. Keeping your French bulldog on a limited ingredient diet is one way to help rule out certain allergies or keep from aggravating known allergies. 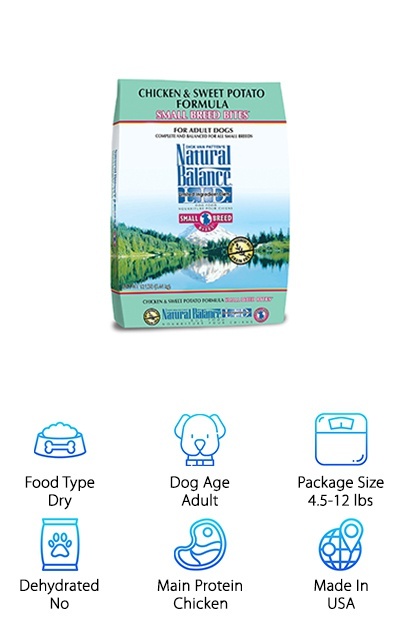 The Natural Balance Small Breed Bites Limited Ingredient Diet dog food is made without wheat, corn, or soy products. It keeps things simple with the top ingredients being chicken, chicken meal, dried sweet potato, and dried legumes. Vitamin and mineral supplements ensure your dog gets all of the nutrition they need without adding numerous additional ingredients. The small kibble size is perfect for small breed dogs and the short snouts of most French bulldogs. It encourages them to chew and helps support clean teeth and healthy gums. Keep it simple while still providing a delicious and nutritious kibble for your favorite pup!